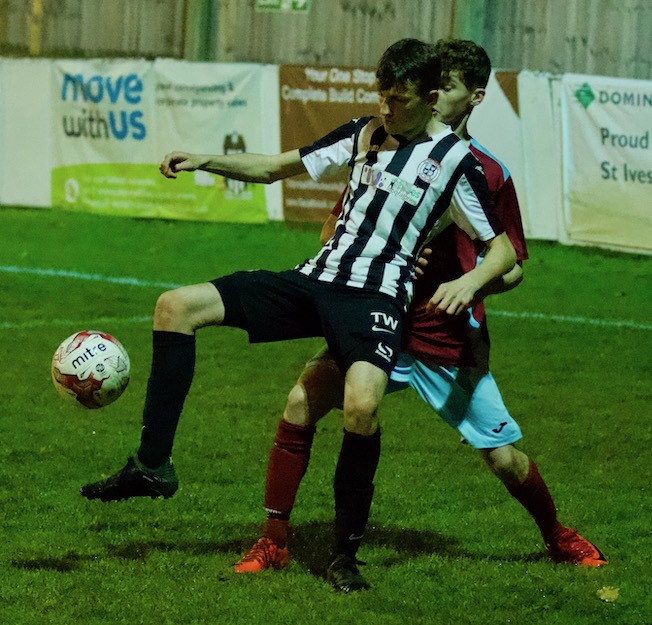 The young Ives completed a swift double over the Hares as they claimed the spoils in a niggly contest in comprehensive fashion, braces from Tom Wakley and Harry Sargent were interspersed by the goal of the game from Connor Gibbs. 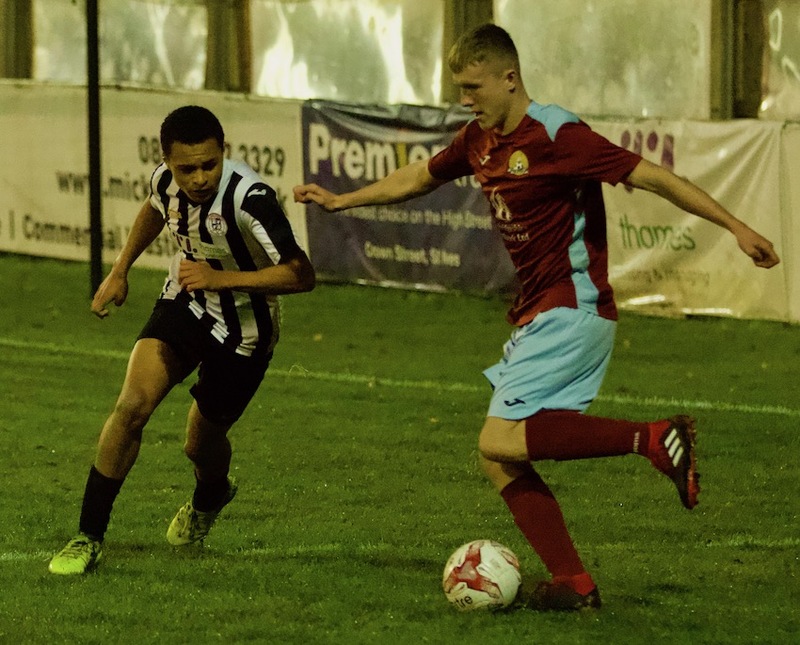 This was a belated return to action for the scholars as their previous two games had been called off due to King’s Lynn’s run in the FA Youth Cup and Downham’s inability to raise a side to visit Westwood Road. 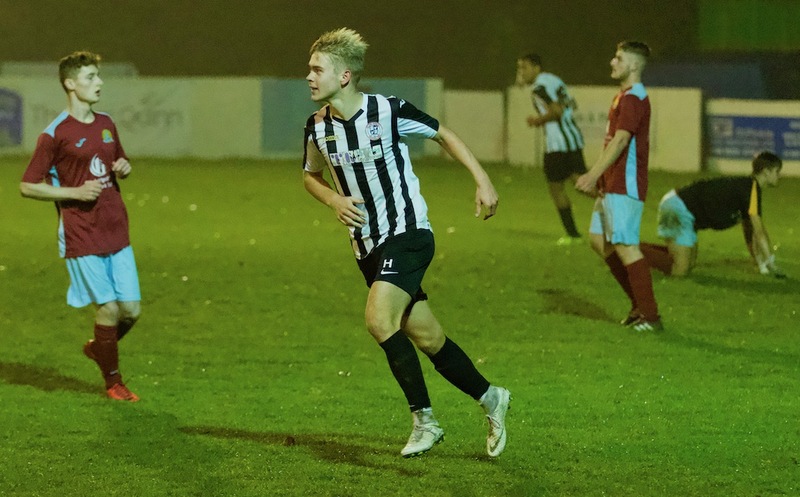 With this unexpected break a slow start might have been anticipated and it was the visitors who created the first chance of the game in eleventh minute as Alfie Asher got to the bye line and dinked a cross over Shay Griffiths at his near post. 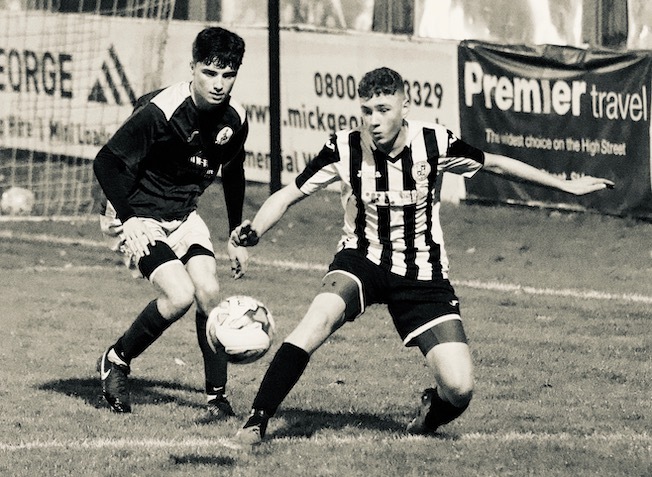 Fortunately skipper Mitchell Pillin was alert to the danger and got above Kai Wales with an excellent defensive header. Ives first good chance came four minutes later as Sargent and Billy Garlick combined well with the latter feeding the ball into the run of Gibbs, a slightly heavy touch by the Ives midfielder was just enough to allow keeper Connor Farrell to sprint from his line and bravely dive in to claim the ball at his feet and snuff out the danger. The hosts were now getting on top and opened the scoring in 24th minute. 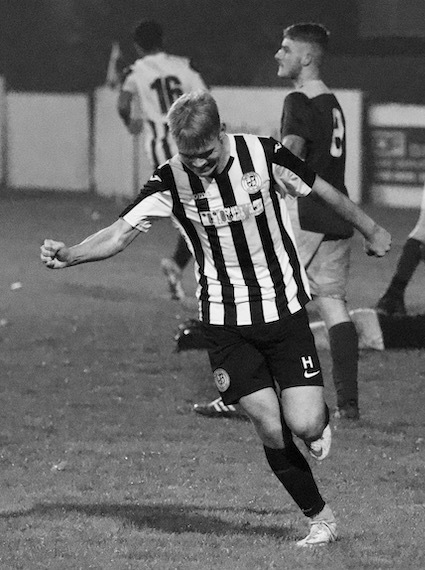 A free kick was cleared out to the right and delivered back into the centre by Joe Purse, the ball evaded everyone in the middle and arrived at the feet of Wakley who had ghosted in unmarked at the back post. The Ives wide man did the rest clipping the ball home past the exposed Farrell from close range. The Hares were not out of the contest and could have grabbed an equaliser only two minutes later as Ives struggled to clear a ball in from the right by Blake Cowley it eventually ricocheted to Finlay Clark who looked like he had a clear run on goal but the ball bounced off his shins to allow Griffiths to make a comfortable claim. Having failed to get on terms the visitors then found themselves two behind just after the half hour. Wakley and Mihayl Mitkov combined well down the left before the latter fed the ball inside the Gibbs 25 yards from goal. The combative midfielder showed the silky side of his game as he spotted keeper Farrell off his line and curled a peach of an effort over the struggling stopper into the roof of the net. Keeper Griffiths gave himself a bit of work to do in 35th minute as he rolled a goal kick to Pillin in the centre of goal just outside the box. The Ives centre back was instantly closed down and robbed by Clark forcing Griffiths into an excellent diving save low to his left to preserve his clean sheet. Clark again went close two minutes later as again Ives struggled to clear their lines allowing the Hares striker to pounce on the loose ball just outside the box and fire in an effort that deflected inches past Griffiths left hand upright. 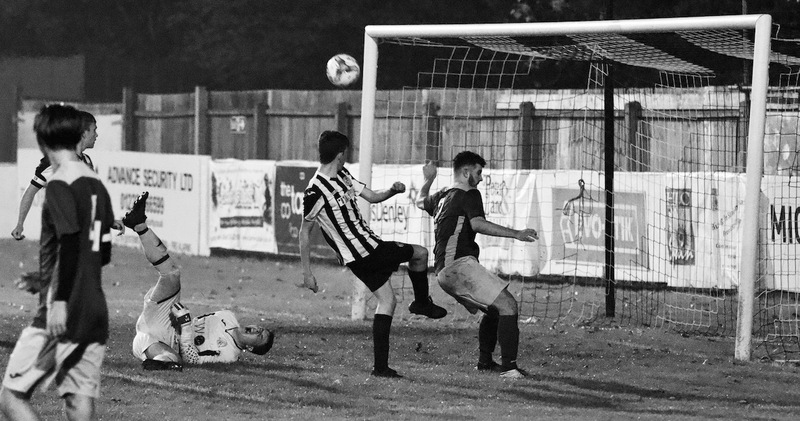 The goal that killed the game as a contest came six minutes before the break as a quick throw by Billy Mobbs deep in Hares territory gave Garlick the chance to run into the box wide on the right. He delivered a low cross into the mix where Sargent showed his bravery getting in between keeper and defenders to prod the ball home from point blank range. It should have been four within 45 seconds of the restart as Ives strung a passing move together through the middle that finished with Purse threading the ball into the run of Sargent on the edge of the Hare’s box but the big striker crashed his right footed effort into the boards just wide of Farrell’s left hand post. The visitors were still breaking sporadically into Ives territory and they went close to grabbing a goal back in 53rd minute Clark slid a ball through the right channel to put Wales in on goal. Griffiths closed him down quickly and made an excellent save only to realise that it was all in vain as the assistant on the far side already had his flag up. Any faint hope the Hares had of getting back into the game was completely extinguished in a crazy few seconds on the hour. A Mitkov corner from the right was delivered in on the keeper and Farrell was a little slow to come and claim it allowing Sargent to go in with the keeper who went down in a heap. Referee Paul Doyle instantly blew for a foul, but full back Jordan Smith allowed his frustration of the evening to bubble over at the official looking likely to earn himself a yellow card. This quickly got changed to a red when the Hares defender continued to abuse the official when summoned to his presence. Whilst all this was going on the groggy looking Farrell was still receiving treatment and he eventually left the field for a trip to hospital with a suspected broken arm. After some discussion amongst the March players and bench Cowley replaced the luckless Farrell between the sticks and the game restarted after an eight minute delay. The Ives were now well on top and with half an hour to go against ten men and a stand in keeper more goals looked inevitable. Substitute Adam Kelly went close only seconds after the resumption as he combined with Wakely down the right before driving into the box and flashing a shot wide of the far post. Sargent did a little better as he doubled his tally for the evening in 74th minute. 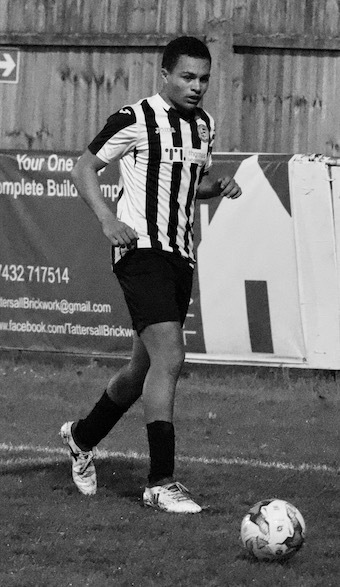 The powerful striker got on the end of a long ball out of defence and strode forward before firing a low left footed effort past the exposed Cowley from the edge of the box. Griffiths still needed to keep his concentration at the other end and he needed to show he was still alert in 78th minute as Clark tried to catch him out with a 45 yard free kick that the Hares midfielder struck well and was dipping in under the crossbar before the fast back peddling Griffiths tipped it over the top. To their credit the ten man Hares continued to battle and protect their stand in keeper right to the bitter end but centre back Connor Paine should have opened his account for the Ives in 88th minute as a Wakley corner from the left was headed down to him inside the six yard box by skipper Pillin. The Ives man struck his shot well but Cowley made an excellent stop with his legs at point blank range. 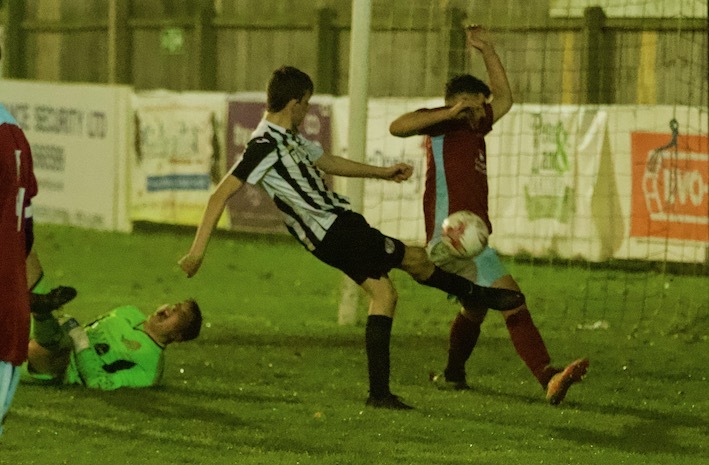 Keeper Cowley made a more unorthodox save with his legs as the game entered added time. 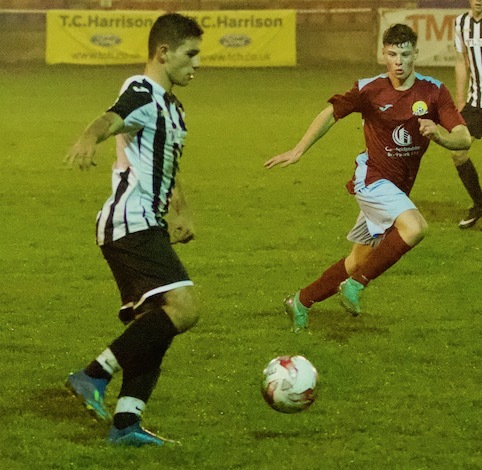 Substitute Ben Smith looked like getting away down the right only to be hauled down by a tiring Ben Darrington. Mitkov swung in the resulting free kick on target and without any thought of using his hands Cowley sliced the ball away with his boot. There was still time for Wakley to double his account for the evening and make the final score five. Sargent looking for his hat trick got put through the left channel and hammered in a first tie effort that pulled a brilliant save out of Cowley as the stand in dived to his right. Unfortunately for him Wakley reacted quicker than any of his defenders to get on the loose ball and force it home.